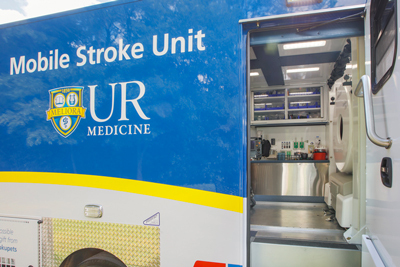 Next month, UR Medicine will begin operation of a Mobile Stroke Unit (MSU), a high-tech ‘emergency room on wheels’ that is designed to provide life-saving care to stroke victims. The $1 million unit will be operated in partnership with AMR as a community resource and represents a significant step forward for stroke care in the Rochester region. While the MSU resembles an ambulance on the outside, inside it contains highly specialized staff, equipment, and medications used to diagnose and treat strokes. The unit is equipped with a portable CT scanner that is capable of imaging the patient’s brain to detect the type of stroke they are experiencing. The scans and results from a mobile lab on the unit are wirelessly transmitted to UR Medicine stroke specialists at Strong Memorial Hospital, who will consult with the on board EMS staff via telemedicine and decide if they can begin treatment immediately on scene. If it is determined that the patient is experiencing an ischemic stroke – which account for approximately 90 percent of all strokes – the MSU team can administer the drug tissue plasminogen activator (tPA) to attempt to break up the clot in the patient’s brain. While en route to the hospital, UR Medicine specialists will continue to remotely monitor and assess the patient’s symptoms. It is estimated that 3,000 people in Monroe County suffer from a stroke every year. Stroke is the fifth leading cause of death and the number one cause of long-term disability in the U.S. However, if caught early, many stroke victims can make a full recovery. The current best treatment for stroke is tPA. But in order to work properly, the drug must be given within four and half hours of the first stroke symptoms. Depending upon the circumstances, doctors may also elect to perform a minimally invasive endovascular surgical procedure that involves threading a catheter through the blood vessels and physically removing the obstruction in the brain. The capabilities provided by the MSU to diagnose, start treatment, and prepare hospital staff to receive the patient before they arrive at the emergency department will save lives and improve chances of recovery. The unit is owned by UR Medicine and will be operated by AMR. The MSU will be staffed by a UR Medicine nurse trained in stroke care and a CT technician, an AMR paramedic and emergency medical technician, and remotely by a stroke specialist at UR Medicine. The construction and operating costs of the unit, which was custom built by Frazer Ltd. in Houston, are being funded by UR Medicine and philanthropy, including a lead gift from Elena Prokupets and support from the Del Monte family and other donors in the Rochester community. The MSU is part of a broader UR Medicine initiative to bring state-of-the-art stroke care to the region. This includes Strong Memorial Hospital’s designation as the region’s only Comprehensive Stroke Center by the Joint Commission, a certification that indicates that the hospital either meets or exceeds the highest standards of care required to provide timely, advanced, and coordinated care to patients with cerebrovascular disease, and the Neuromedicine Intensive Care Unit, a 12-bed ICU that provides care to critically ill patients with complex neurological life threating illnesses such as stroke. UR Medicine stroke specialists also provide 24/7 consultation services for emergency department personnel in several hospitals in the region via telemedicine. Eight years ago, UR Medicine, in partnership with the Greater Rochester Health Foundation, created the Stroke Treatment Alliance of Rochester/New York (STAR-NY), to educate medical professionals and the broader community about stroke recognition and prevention. A series of awards from the American Heart Association (AHA) to a team of researchers at the University of Rochester Medical Center (URMC) will focus on the development of new treatments to thwart the damage in the brain caused by stroke. One of the research projects brings together experts in stroke, cardiovascular biology, platelet biology, and peptide chemistry. Marc Halterman, M.D., Ph.D., with the URMC Center for Neurotherapeutics Discovery, Scott Cameron, M.D., Ph.D., and Craig Morrell, D.V.M., Ph.D., with the URMC Aab Cardiovascular Research Institute, and Bradley Nilsson, Ph.D., with the University of Rochester Department of Chemistry will focus on the role that platelets play in acute brain injury and inflammation during stroke. Platelets serve an important role in protecting against blood loss and repairing injured blood vessels. However, during a stroke the inflammatory properties of platelets can interfere with the restoration of blood flow once the clot in the brain is removed, particularly in micro-vessels, which can lead to permanent damage of brain tissue. The research team will build synthetic peptides that activate platelets to study the phenomenon – which is called no-reflow – in an effort to identify specific switches within platelets that can be turned off and limit the cells’ inflammatory functions without blocking their ability to prevent bleeding. Two AHA pre-doctoral fellowship awards Kathleen Gates and Jonathan Bartko in Halterman’s lab will support research that examines the link between an immune system response triggered by stroke in the lungs that can exacerbate damage in the brain and investigate the cellular mechanisms that determine whether or not brain cells die following stroke. A final AHA award to the Halterman lab will seek to identify new drug targets by focusing on specific proteins activated during stroke that are suspected to play an important role in determining the survival of neurons. Collectively, the AHA Collaborative Sciences Award, Pre-Doctoral, and Innovation awards represent $1.09 million in funding. The American Heart Association/American Stroke Association (AHA/ASA) has once again honored the UR Medicine Strong Memorial Hospital for having achieved the highest standard of care for stroke. This award identifies hospitals that provide care that can speed the recovery and reduce death and disability for stroke patients. Strong Memorial Hospital has received the 2018 AHA/ASA Get With The Guidelines program’s Stroke Gold Plus Quality Achievement Award. The hospital was also recognized for the Target: Stroke Honor Role Elite Plus designation, which identifies hospitals that have consistently and successfully reduced door-to-needle time – the window of time between a stroke victim’s arrival at the hospital, the diagnosis of an acute ischemic stroke, and the administration of the clot-busting drug tPA. If given intravenously in the first four and a half hours after the start of stroke symptoms, tPA has been shown to significantly reduce the effects of stroke and lessen the chance of permanent disability.